Dosto Aaj Ham Janenge- WhatsAap Par Blank Empty Message Send Kaise Karte Hai, Matlab WhatsApp Par Aap Kisi Ko Bhi Blank Khali Empty Message Send Kar Sakte Hai. Apko Ko Toh Pata Hi Hai WhatsApp Kitna Popular Social Messanger App Hai, Dekha Jaye Toh 80% Android User WhatsApp Se Jude Hye Hai, Matlab Ki Jo Internet Use Karrahe Hai Uske Mobile Me WhatsApp Milega Hi, Kheer. Apne Kabhi Note Bhi Kiye Honge, Agar Apke Kisi Friend Ne Apko Empty Message Send Kiya Hoga, Toh Ab Ap bhi khali Blank message send kar sakte hai, Apke Kisi Bhi friends ko. 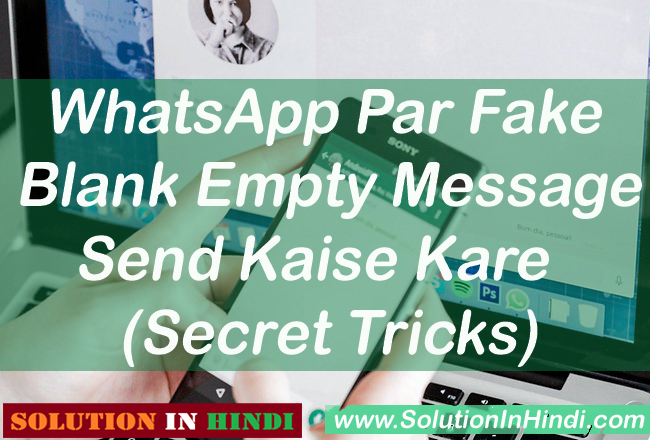 Dosto Agar Aap Nhi Jante Hai, WhatsApp Par Khali Empty Message Bhej (Send) Kaise Karte Hai, Toh Aap Iss Post Ko Carefully Read Karte Rahe, Solution In Hindi Se Aap Whatsapp Hidden Features Jan Payenge. 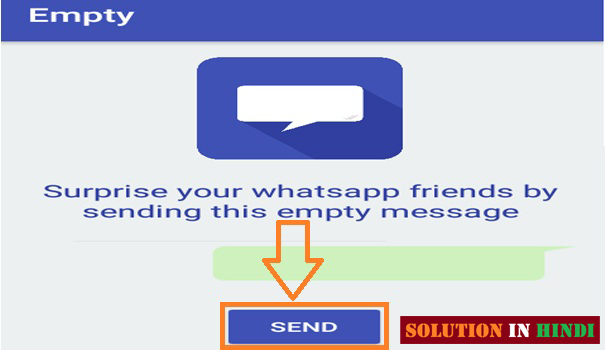 Toh Chale Jante Hai How To Send Empty Message On WhatsApp In Hindi. WhatsAap Par Fake Blank Empty Message Send Kaise Kare? 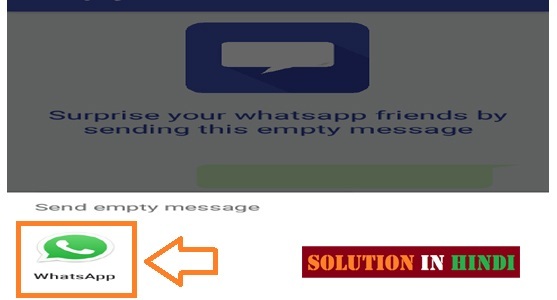 Dosto WhatsApp Far Blank/Empty SMS Send Karna Bhut Hi Simple Hai, Main Apko 3 Method Bataunga Jiske Madad Se Aap Kisi Ko Bhi Blank Message Send Kar Sakte Hai, Keyword Carecter Symbal Our Apps Ki Help Se Blank Message Bheej Sakenge, Jiyada Tar Friends Apps Se Hi Blank Message Send Kiya Karte Hai, Lekin Main Apko Keyword Se Blank SMS Kaise Kare, Woh Bhi Bataunga, Uske Bad Apke Margi Jo Pasand Aayega Woh Method Use Karenge. Sabse Pehle WhatsApp Messanger Open Kare. Ab Jis WhatsApp Contact Friends Ya Group Me Blank Message Send Karna Hai Us Par Click Kare. Grave Accent (“` “`) Ho Gaye Hai Toh Message Send Kare. Done! WhatsApp Par Blank Empty Message Send Ho Chuka Hai. Sabse Pehle Empty Messanger Play Store Se Install Kare. Install Ho Gaye Hai Toh Empty App Ko Open Kare. Open Karne Ke Bad Send Ki Button Par Click kare. Ap Pop-up Ki Tarah Page Me WhatsApp Messanger Show Karrahe Hai WhatsApp Par Click kare. Ab Jis Friend Ya Group Me Blank Message Send Karna Chahte Hai, Us Contact Ko Select Kare. Select Kar Liye Hai Toh (✔) Message Send Kare. Done! Fake Empty Blank SMS Send Ho Gaye Hai. Sabse Pehle No word. Empty Or Blank Message App Download Kare. Download Ho Gaye Hai Toh No word App Open Kare. Open Karte Hi Apke samNE Send Ki Button Show Hoga Us Par Click kare. Ab Jis Contact (Friend) Ya Group Me Send Karna Hai Usko Select kare. Select HGayeye Hai Toh Send Ki Button Par Click kare. Done! Blank Message Successfully Send Ho Chuka Hai. Agar Koy WhatsAap, Related Ya Phir Computer, Mobile, Earn Money, Social Media, Facebook, YouTube, & Internet Ki Toh, Comment kar Ke Bata Sakte Hai. Our Han Apne Friends Ke Sath Share Karna Na Bhule, Our www.solutioninhindi.com Ke Sath Update Rahne Ke Liye Subscribe Kare. Other Social Media Par Bhi Hamare Sath Jude Rahe. Wow So Cool WhatsApp Tricks.. Thanks For Sharing This WhatsApp Hidden Tricks..
Visit Karte Rahe Our Bhi WhatsApp Hidden Tricks Milte Rahenge.. Thank You.. Thank You & Visit Again.. Thank You & Visit Again..!